It has been a while since I have posted anything more from lack of time than anything else. I aim to change that in 2012 as best I can. Cheese is still a big part of my life, regardless if I have devoted time to write about it or not. My plans for the early part of this year include more blogging, a return to cheesemaking, and farm visits once again. In order to kick off this year, I visited a shop on Long Island just minutes away from our friend’s house where we were visiting. Artisanal cheese has made its way to the forefront of the local food movement. Farmstead cheesemakers elevate the milk from their farms, and the rock star cheesemonger expounds upon the history, the background, and unique qualities of that particular cheese. So what is the best way to accomplish this? 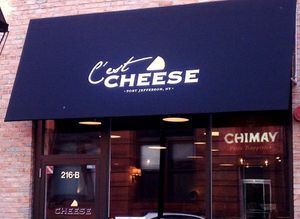 Specialty cheese shops are all over New York City and surrounding areas to bring a piece of the farm to your table, but is that enough to distinguish one shop from another? If the quality of the product is essentially the same across the board, and the level of care is (in a good shop) similar as well, then what sets one shop apart from another?